Microsoft has reported revenues of $16.2bn (£10.1bn) for the first fiscal quarter of 2011, beating analysts' estimates of $15.8bn and up 25% compared to the same period a year ago. Although trailing Apple's last quarter revenue by over $4bn, Microsoft profits were over $1bn greater at $5.41bn. 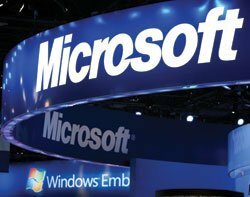 Microsoft reported operating income at $7.12bn and diluted earnings per share of $0.62. The company said revenues from the Windows division increased by 66% to $4.79bn. Office 2010 sales were up, with revenue growing 15%, revenues for the server and tools division were up 12%, and Xbox 360 sales grew 38%, outselling other consoles in the past four months in the US. The signs of solid demand for Microsoft's PC software sent its shares up by 3% in after-market trading. The strong results calmed investor concerns about weakening conditions in the PC business and the risk of an immediate competitive threat from Apple's iPad, according to the Financial Times. Weaker notebook sales have prompted speculation that Apple's iPad has already started chipping away at the edges of Microsoft's PC stronghold, the paper said, but according to Microsoft, there have been no signs yet that consumers were abandoning sales of machines running its software in favour of the iPad.